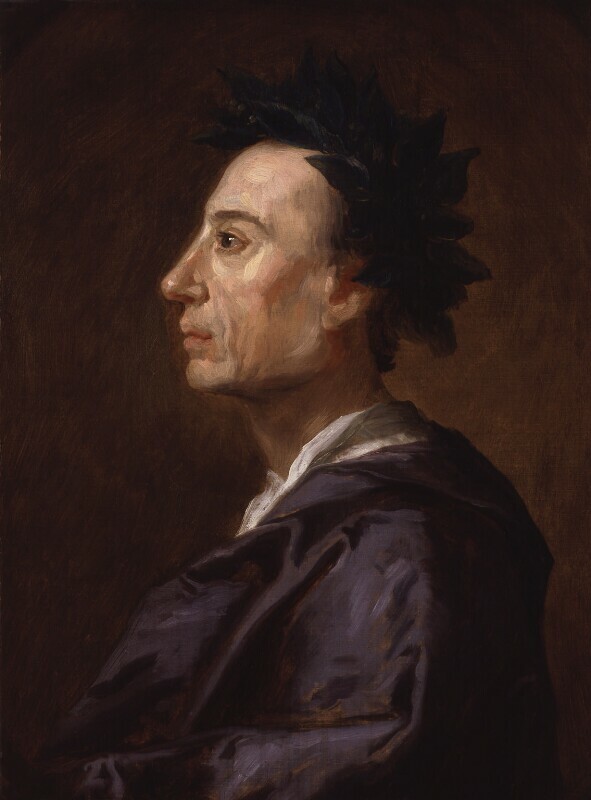 Alexander Pope (1688-1744), Poet. Sitter associated with 44 portraits. Jonathan Richardson (1667-1745), Portrait painter. Artist associated with 124 portraits, Sitter in 8 portraits. In a rococo frame of unusual design, perhaps originally intended for a pastel. More detailed information on this portrait is available in a National Portrait Gallery collection catalogue, John Kerslake's Early Georgian Portraits (1977, out of print). Death of Queen Caroline, wife of George II, on 20 November. Frederick, Prince of Wales quarrels with his father. The king expels him from court for criticising the government. Theatrical Licensing Act introduces censorship, requiring plays to be submitted to the Lord Chancellor for approval and reducing the number of theatres. French portrait-painter Jean-Baptiste Van Loo arrives in England where he soon attracts prominent sitters such as Robert Walpole, Colley Cibber and William Murray, 1st Earl of Mansfield. Venus passes in front of Mercury and is witnessed by amateur astronomer John Bevis at the Royal Greenwich Observatory. It remains the only such planetary occlusion that has been directly observed. Colonist William Byrd founds Richmond, Virginia. French Académie Royale de Peintre et de Sculpture begins its programme of public exhibitions. Florence loses her independence when the last Medici Grand Duke of Tuscany dies.